You may be thinking Banana Bread? In August? Isn’t that more of a winter snack? but with the recent cooler temperatures (thank goodness!) and some bananas that were past their prime, I figured, what the heck. 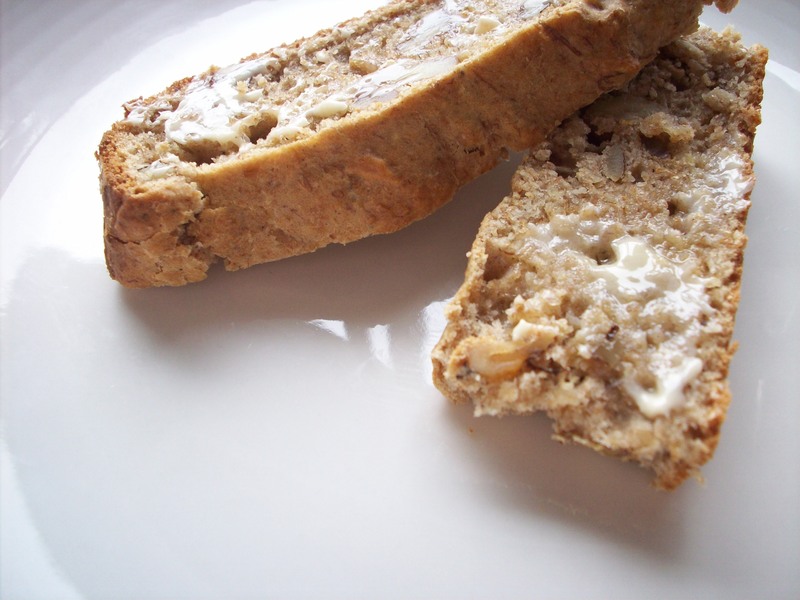 Besides, banana bread is good any old time: fresh and warm, cold the next day, toasted with butter, with jam or peanut butter or both, with tea or coffee, as a snack or for breakfast. If you have made banana bread before, you will know that it is best with very over ripe bananas. I am a finicky banana eater, so for me there is about 20 minutes in the life of a banana in which I will eat it (when the green is gone but it doesn’t yet have any brown spots). Once they start to go spotty, I usually just toss them into the freezer to blacken. That way I always have ultra ripe bananas to bake with and they aren’t rotting in the fruit bowl. To defrost, I just leave them on a plate over night, or set them in a sinkful of cold water for an hour or so. Once defrosted, their peels will slip right off and the over ripe fruit will come snirggling out and will be the perfect texture to be assimilated into banana bread batter. I was determined to make up this recipe myself, and I was completely prepared for it to fail utterly. The greatest fear when experimenting with baking is the leavening. Un-risen baked goods just aren’t good and it’s beyond disappointing to go to the time and effort of whipping up a cake or loaf only to find it “cooked” but with a dense gluey layer near the bottom. Alternatively, you don’t want to risk over leavening something and giving it the metallic tang of baking powder or baking soda. As with all creative endeavours, one must be brave, prepared to fail and try again, but also confident and optimistic that at the very least you will have learned something. With that in mind, I took a few calculated risks (using heavier whole wheat flour, a combination of both baking powder and baking soda with eggs for lift). Since I used a wide, shallow dish (8×8) this was not a tall loaf and came out more the size of biscotti, but still light and cake-like. If you want a more “loafy” loaf, use a loaf pan, but since it will be considerably thicker you will need to adjust your baking time , likely to about 50 or 60 minutes. Before I leave you with the recipe, I apologize for the lack of process/instructional photos; I was experiencing some technical difficulties this morning, but did manage to get a few shots once it was out of the oven. Enjoy! Sift together all the dry ingredients. Set aside. In an electric mixer, cream the butter and brown sugar. Add the rum and vanilla. Once thoroughly mixed, add the eggs, one at a time. Beat well for 2 minutes until light, fluffy and well blended. With the mixer running, add the mashed bananas, and lastly the milk. Add the dry ingredients to the wet in 3 additions, mixing gently on low speed. Fold in the walnuts by hand. Distribute the batter (it will be quite sticky) into the baking vessels. For the 8×8″ cake I baked it for 40 mins at 350. The 18 mini muffins from the remaining batter took just 18. To test for doneness, insert a toothpick or skewer into the center of the cake and if it comes out clean, it’s ready. If it still has damp crumbs clinging to it, give it another 5-10 minutes. Invert onto cooling racks and allow to cool completely. Slice and serve!